Belt Conveyor is a special kind of ore processing machinery and equipment used for gravel transportation. Because of its large transportation capacity, low running resistance, low noise, low energy consumption, convenient installation, long service life, simple maintenance and so on. Advantages determine the belt conveyor in the gravel production line occupies a very important position. 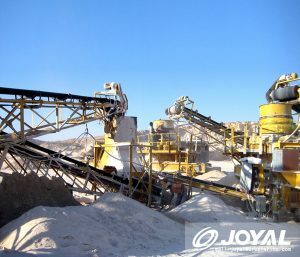 Shanghai Joyal mining machinery is a professional manufacturer of ore processing machinery and equipment, here and we talk about the belt conveyor belt installation process need to pay attention to the relevant issues. The end of the tape conveyor is the assembly, and with the belt conveyor to promote the movement to continue to move, the installation should be strictly in accordance with the design standards to assemble, to ensure the quality of installation. In addition, the installation of the tail of the machine to pay attention to its connection with the transfer machine, so that the unloading point of the loader is located in the middle of the belt machine to avoid uneven operation of the belt conveyor caused by deviation, resulting in tape conveyor in the delivery process problem. Belt conveyor mainly rely on the belt conveyor, so the belt is very important in the belt conveyor, we should pay attention to the belt conveyor belt installation. Belt conveyor belt installation should pay attention to the belt when the buckle buckle must be aligned, otherwise the joint is not due to uneven force caused by deviation; traction should pay attention to check, the beginning to pay attention to adjust the tail roller to prevent the wire rope in the machine Tail roll off, the middle should pay attention to prevent the edge of the tape and the rack card, pull the belt.